While Skinner’s exegesis from the selected texts is reasonable to show that his view stands, he seems to have undervalued the significance of texts like 1:29; 3:16-17; 8:12; 9:5; 16:8; 17:21, 23, where the world clearly remains the object of God’s love and the evangelistic target of Jesus and the Paraclete (subsequently the Christian community). There is a tension between the unbelieving/rejecting attitude of the world towards Jesus and the hopeful conversion of the world for which Jesus/the author maintains. If the unbelieving characters/traits are represented by the world, the believing characters are also represented by the world. Being also members of the world, the Samaritans, the Samaritan woman, the blind beggars, and the disciples etc. encounter Jesus and are called to be children of God. They are from the world; upon understanding God’s love and through their believing understanding, they no longer belong to it while they are still in it (cf. 17:11, 14-16). The Pharisees’ fear in 12:9, “the world has run off after him,” though hyperbole it may be, ironically contains an element of truth. Far from expressing the world’s following in ignorance as Skinner claims (p.67), these words of the Pharisees can be a partial summary to Jesus’ ministry. Through these words, the author shows to the readers that, in contrast to those religious elite, truly some members of the world can be receptive to Jesus’ message. A clear example is that even the crowd (7:31, 40-43) are divided in their attitude towards Jesus. Time and again, the world is the receiver of God’s promises, though unfulfilled to some, yet definitely not to the others. In light of these observations, it seems the more complex traits of the world should be further explored. I am, of course, thankful for the engagement and I think Tam raises some helpful questions. However, I would say in response that if Tam had read the introductory portion of my essay a little more carefully, he would have noticed where I map out a specific approach for my analysis of the world as a character. I am focusing on specific instances where the kosmos behaves as the Johannine Prologue (1:1-18) predicts. I am also clear that my focus is intentionally narrow. 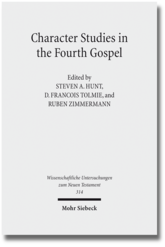 I wanted to examine the kosmos as a character (the aim of the volume) as opposed to a comprehensive discussion of the concept of the kosmos in the Fourth Gospel.